demonstrates to students that life and learning are connected and holistic, like "the real world" outside the four square walls of school. See below for suggested ways to integrate environmental education and sustainability learning into all subject areas. 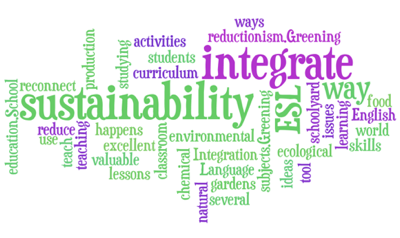 Why is integration so important in a green curriculum? What are the dangers of reductionism? A main lesson of ecology (indeed, the essential science of ecology and sustainability) is that everything is interconnected. But the longer our students stay in school, the more they are "subjected" to disconnection — taught, through subject specialization and reductionism, a worldview in which everything is disconnected. They can't see the real world "forest" that is life for all the homework and marks given out as "trees." This separation of subjects and fragmentation of learning makes life less intelligible to students, further disconnecting them from the rest of Nature (which doesn't ring bells, switch subjects, or suddenly turn to math at 10 o'clock). As Jane Goodall explains, Nature (if taught at all) is just objectified in education — turned into things to study, not to become part of. In direct opposition to the trend in mainstream culture toward greater specialization, we need to actively promote the generalist — the one who sees connections and makes links across different disciplines. Our students learn some good things about the environment in school. But the rest of the school community (their other teachers, administrators, staff, parents) must reinforce and value the students' integration of that learning into other subject areas. Otherwise, our students won't learn that the unsustainability crisis is one that demands changes to their education, to the EuroAmerican lifestyle, and to the Western system of economics. Integration in education for sustainability has to be done by the students themselves (to preserve childhood's holistic and pattern-based perception of life). interspersing your teaching with integrating questions, such as "How can what you’ve learned today (this period) best serve the Earth and the future?" Teachers will be able to identify points of connection between these themes [of education for sustainability] and the content prescribed in their own subject areas. While some subject areas lend themselves more than others, all have a responsibility to contribute. Educating for sustainability offers innumerable opportunities for integrating ecological literacy and an environmental ethic into the curriculum. This integration shows students, in a holistic way, that we value the Earth and their future. No matter what our subject, if we are not teaching consciously and deliberately FOR sustainable development, then our "hidden curriculum" is, by default, teaching for UNsustainable development. Click on the links below for integration ideas in each subject area (as they become available). Green Schools model how core ecological concepts can be applied to create sustainable human communities. If your school is becoming a Green School, sustainable improvements in your facilities will provide a unique opportunity to take an experiential "place as pedagogy" approach to teaching. along with rich group thinking amongst our like-minded and like-hearted colleagues. If there's a curriculum area I've left out, please send us your ecological / sustainability integration ideas for that subject and I'll include them here.